PIC. 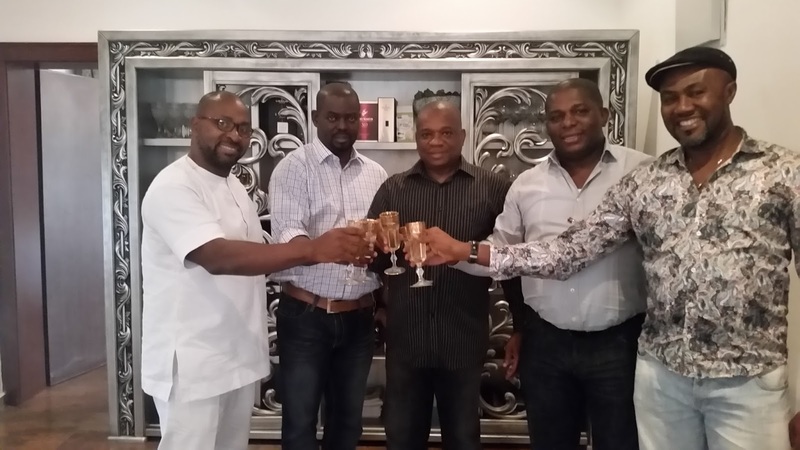 from left: Prince Michael Chinedum-Obiekwe, CEO Music; Shola Arogun, Director; Dr. Orji Kalu, Founder; Mr. Mascot Kalu, Chairman; and foremost Nigerian actor Mr. Uche Odoputa DGN, CEO Movies at the launch of the company in Abuja. Renowned industrialist and former Governor of Abia State, Dr. Orji Kalu, has called on well-meaning Nigerians to create employment for the teeming youths by investing in the entertainment industry, adding that the country's overdependence on oil is worrisome. He made the remark at the launch of OUK Entertainment International Limited in Abuja on Thursday. According to the Progressive People's Alliance (PPA) candidate at the March 5 Abia North senatorial rerun poll, who is also the founder of the corporation, he was touched with the level of unemployment and poverty in most communities visited during his electioneering, adding that regardless of the result of the poll, he will continue to contribute to the social, political and economic development of the country through entrepreneurship and humanitarian gestures. The entertainment company headquartered in Camp Neya Resort, Igbere, Abia State will have regional offices in Lagos, Abuja and Enugu, with a focus on hunting for new talents in the music and movie industries beyond the shores of Nigeria. A South Africa-based businessman and night club owner, Prince Michael Chinedum-Obiekwe, is the Chief Executive Officer (Music) of the newly incorporated firm with foremost Nigerian actor Mr. Uche Odoputa as Chief Executive Officer (Movies). In his remarks, the Chairman of the company, Mr. Mascot Kalu, pointed out that the idea to establish the new entity was borne out of the desire of Dr. Kalu to create jobs occasioned by the suffering in most localities visited during his senatorial campaign and subsequent stakeholders' meeting with the youths. His words, "we need to explore new frontiers in business by creating fresh ideas and opportunities and one of such is the establishment of this entertainment company. “We want to complement the efforts of the present administration in diversification of the economy. “This initiative will create a new Hollywood in Igbere. It will definitely stimulate growth in Abia State and its environs”. The ex-investment banker added, "in the next few months, production will roll out from zero to the end. "The company is to discover new artistes and also assist established artistes who need financing to produce their works. "The entertainment outfit will also have a training school for actors, musicians and other allied professionals in the industry", he concluded. Also present at the launch of the company in Abuja was a director of the company Mr. Shola Arogun. Follow OUK Entertainment International Limited on twitter: @oukent.